Last week, there was a rally in Washington, D.C. How many people actually attended the rally is uncertain. The organizers themselves claim that 8,500 people attended, while more objective estimates from people not associated with the march put the number at probably less than 1,000. Of course, such wide variations in estimates for the attendance at such events are not uncommon. For my purposes it is irrelevant whether 500 or 8,000 attended because even if the lowest estimate is closer to the true number this march represented the largest march on Washington ever for this particular cause, the previous largest having occurred three years ago. 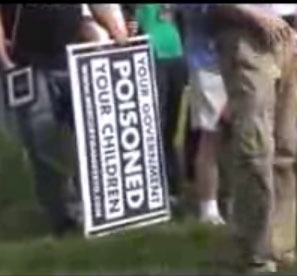 Fortunately for public health interests, the organizers’ timing was very bad (for them, at least) in that they marched last Wednesday, the very day after Barack Obama clinched the Democratic nomination. The media were rife with coverage of the history-making nomination of the first African-American as a nominee of a major party, as well as speculation about when and whether Hillary Clinton would concede and endorse Obama. Drowning out most other news, Obama’s nomination led to almost nonexistent news coverage of the rally, aside from a handful of television appearances by one of its celebrity organizers. Its relative lack of success notwithstanding, however, all who support science- and evidence-based medicine should nonetheless remain concerned about this rally, because it was a dagger aimed at the heart of the most effective public health innovation ever conceived by the human mind, an intervention that has arguably saved more lives over the course of human history than every other medical intervention combined. That this dagger turned out to be a toothpick is fortunate indeed but by no means a reason to dismiss the movement that spawned it as irrelevant. 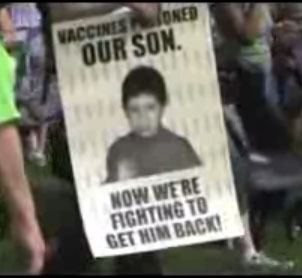 I’m referring, of course, to the antivaccinationist movement, and the rally was known as the “Green Our Vaccines” rally, led by the celebrity couple Jenny McCarthy and Jim Carrey and organized and funded by Talk About Curing Autism (TACA), Generation Rescue (upon whose board McCarthy now sits), and a panoply of other groups that promulgate the myth that either vaccines containing mercury in the form of their thimerosal preservative or vaccines themselves cause autism. What I really am is “anti-toxins” in the vaccines. I do believe that there is a correlation between vaccinations and autism. I don’t think it’s the sole cause, but I think they’re triggering–it’s triggering–autism in these kids. A really great example is…is, sometimes obesity can trigger diabetes. 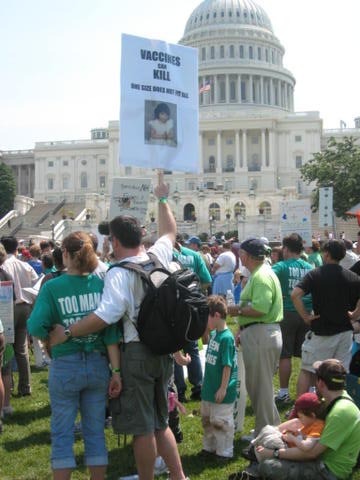 I do believe that vaccines can trigger autism…It’s so much more than just mercury. That is one ingredient in the recipe of autism…People don’t realize that there is aluminum, ether, antifreeze, still mercury, in the shots. I’ve referred to this before in the context of the Generation Rescue ad that first introduced the “Green Our Vaccines” slogan to the world. 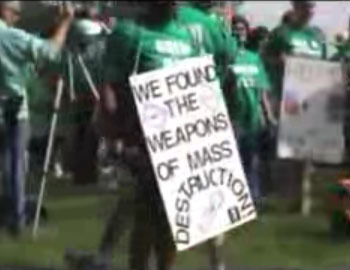 Indeed, I doff my hat to the organizers at this march they’ve framed the issue with such a wonderfully Orwellian slogan that’s brilliant because of how difficult it is for rational scientists to counter. After all, who doesn’t want “safer” vaccines? No one, of course! Not even the the man who is to antivaccinationists the Devil incarnate, vaccine scientist and defender Paul Offit, would say that he doesn’t want safer vaccines, too. Indeed, he’s spent his career trying to do just that: Develop more effective and safer vaccines. Certainly I can’t argue with making vaccines as safe as possible. They happen to be, by any reasonable measure, remarkably safe right now, but there’s always room for improvement. What the press and others at whom this crunchy eco-friendly message of reassurance and seeming reason that fits right in with the current mood of the country is aimed don’t realize is just one thing. 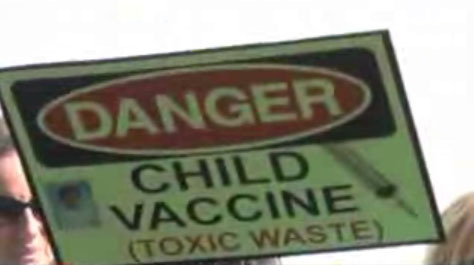 After all, if there are indeed all sorts of horrible toxins in vaccines, shouldn’t we get rid of them? It all sounds so measured, so reasonable, and so conservative. Too bad it’s about as disingenuous as it gets. Like Steve Novella, I have no doubt that Jenny McCarthy and Jim Carrey mean well, but I agree that it’s not enough to mean well. There’s a famous saying that the road to hell is paved with good intentions. My usually corollary to this saying is that good intentions coupled with misinformation and self-righteousness are the straightest and surest route to hell that I can think of, and among the best examples of this corollary are parents who have been misled by the pseudoscience of the cottage industry of autism quackery that depends on the belief that vaccines cause autism for its profitability. Couple that with the arrogance of ignorance, which Jenny McCarthy exhibits in abundance and which apparently drives her to conclude that attending the University of Google qualifies her to shout down doctors and scientists on Larry King’s show, and you have a truly toxic brew of self-righteously misdirected anger. Yes, the dreaded “toxin” gambit beloved of antivaccinationists was writ large in green and white all over Washington, a variation of which Jenny McCarthy had been parroting beforehand and that I presciently deconstructed a while back when Age of Autism contributor Kent Heckenlively produced such an over-the-top, jaw-droppingly silly invocation of this particular canard that I had a hard time believing anyone could write something so ill-informed. Not only was Heckenlively’s version of this gambit wrong, but it was so extravagantly and outrageously wrong that he even–incredibly–raised concerns about the sucrose in vaccines on the basis that excessive sucrose intake can lead to obesity, tooth decay, and type II diabetes. It’s as though he thinks that babies are being fed copious quantities of vaccine and are in danger of rotten teeth and obesity from it. Truly, you just can’t make stuff like this up. Suffice it to say that apparently no one wasn’t with her. I will give Jen123 kudos, though. She perfectly and succinctly stated the true purpose of the “toxin” gambit. 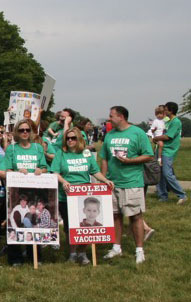 The “Green Our Vaccines” movement is nothing more than the very same sentiment wrapped up in a nice, friendly slogan that on the surface sounds so very, very reasonable, particularly when antivaccinationists mention all those really scary-sounding ingredients, unconcerned with getting the actual niceties of the chemistry right. For example, they either ignorantly or willfully confuse ethylene glycol (antifreeze, which is not in vaccines) with polyethylene glycol (a polymer of ethylene glycol, a chemically different compound which is in some vaccines and is also in a number of skin creams, toothpaste, and medications, including laxatives) or ethyl ether (a flammable liquid that was one of the first anaesthetics but has long since been supplanted by much safer agents) with polyethylene glycol pisooctylphenyl ether (Triton X-100, a kind of soap/detergent). They even go so far as to act horrified about the caustic properties hydrochloric acid, which is used to titrate the pH of vaccines to neutral, as though vaccines contained 12 M HCl! 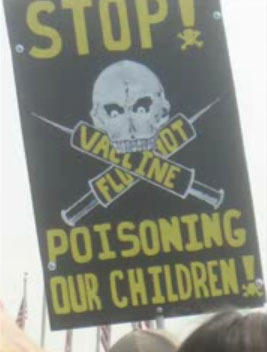 They’ll also rant on and on about formaldehyde, neglecting the fact that most people are exposed in a single day to more formaldehyde from plastics, plywood, furniture and furniture finishes, and a variety of other household products and objects in every house than babies are exposed to from their entire vaccine schedule. Moving away from chemistry to misunderstandings of biology, there’s also a love of harping on “aborted fetuses,” as though vaccines were somehow made from aborted fetal tissue. The reality is far less dramatic. For some vaccines, viruses are grown in a cell line derived from an aborted fetus nearly 45 years ago and maintained continuously in cell culture since. (Some antivaccinationists do know this, but they like to try to tap into religious objections to abortion by playing this gambit.) The whole bit about “monkey cells” is a similar gambit. Some viruses are indeed grown in monkey kidney cells, but it’s not as though these cells are retained in the vaccine, and antivaccinationists will play into this as though it somehow makes vaccines “dirty” sometimes even invoking the spectre of HIV. The seem to forget about a little step called “purification.” Viral particles are isolated and the cells are eliminated, just as the human fetal cells are. Maybe they believe in a homeopathic theory of vaccination, in which the vaccines somehow retain a memory of the monkey cells with which they have been in contact but that have been removed from the final product. I am surely not going to tell anyone to vaccinate. But if I had another child, there’s no way in hell…….for my next kid—which I’m never going to have—there’s no way. Ever since there have been vaccines, there have been antivaccination movements. Indeed, it was not long after Edward Jenner discovered how to use the weaker cowpox virus to induce long-lasting immunity to smallpox that resistance to the concept of vaccination appeared, a resistance that continues to this very day. Reasons for this resistance started out primarily religious, with clergy arguing that people who became ill did so because it was God’s will and that vaccines were an arrogant attempt by Man to thwart that will. They then evolved to more modern fears of injecting “unnatural” substances into the body or simple resistance to the government telling people what to do, the latter of which particularly resonates in the U.S. Many fear even the infitessimally small risk that vaccines pose for the benefit of resistance to disease far more than they fear the diseases themselves, a result of the very success of modern vaccines. Of course, vaccines, like any other medical intervention, are not without risks, making it easy for them to jump on any hint of harm done by vaccines, whether real or imagined, even though vaccines are among the very safest of treatments. This brings us to the other major slogan of the rally, namely “Too Many, Too Soon.” This, too, is a conveniently vague but oh-so-reasonable-sounding slogan. It, like “Green Our Vaccines,” is also another strategy to move the goalposts. The concept is based on the expansion of the number of recommended vaccines since 1983. Confusing correlation with causation yet again, anti-vaccine activists make the observation that the prevalence of autism has increased markedly since 1983, when the number of vaccines recommended for infants and small children was ten, to now, when the recommended number is 36. Indeed, this was a huge component of Generation Rescue’s deceptive full-page advertisement in USA Today that appeared back in February. The concept is simple. It is postulated that the increasing number of vaccines somehow “overwhelms” the immune system or causes some sort of “aggregate” toxicity that is responsible not just for autism, but a variety of chronic diseases, such as obesity and type II diabetes, asthma, and autoimmune diseases. That there is no even mildly compelling scientific or epidemiological evidence to support these claims doesn’t matter. Antivaccinationists have thus far successfully wrapped themselves in the mantle of caution that to most parents without a background in science or epidemiology seems eminently reasonable. It also sounds, on the surface at least, eminently reasonable when antivaccination activists claim that it’s the combination of vaccines that cause all these neurodevelopmental problems like autism. It’s also a conveniently difficult to falsify claim. Clearly activists have learned from their mistake with mercury never to make a hypothesis that makes a relatively easily testable prediction. The thimerosal hypothesis made the prediction that if thimerosal in vaccines were removed autism prevalence should fall rather rapidly within 5-7 years, given that the age range when most autism is diagnosed is from 3 to 5. Autism prevalence hasn’t fallen; it’s still rising. Even those who claimed that “it’s the mercury, stupid” and that “autism is a misdiagnosis for mercury poisoning” now realize that neither of these statements is true. The most that can be said from current data is that maybe, just maybe, a very small number of susceptible children could have a reaction that might manifest itself as autistic symptoms–hence the moving on to other “toxins.” In contrast, the “Too Many, Too Soon” hypothesis is much vaguer and difficult to extract easily testable hypotheses from, which is the whole point of it. Of course, no scientific evidence is ever presented that rises above the level of Dr. Laura Hewitson’s badly designed monkey study, Generation Rescue’s even more poorly designed “telephone survey” of vaccinated and unvaccinated children, or Dan Olmsted’s easily falsified claim that the Amish do not vaccinate and do not get autism to support their contention that the current vaccine schedule is harmful. Moreover, when the GOV movement claims that current vaccines haven’t been tested in combinations, it’s just plain wrong. All new vaccines are tested in clinical trials against the background of the current vaccine schedule. In other words, if it’s a new vaccine not currently recommended, in clinical trials it’s merely added to the current schedule. If the vaccine is for the same disease as a currently used vaccine, then the trial looks at the new vaccine versus the old vaccine, all other vaccines in the schedule remaining the same. The reason we don’t do serial “one-at-a-time” trials is simple, but nonetheless antivaccinationists never seem able to grasp the concept: It would be extremely unethical to withhold protective vaccines from children in order to test them against no vaccines because it would leave the no vaccine group of children vulnerable to vaccine-preventable diseases. In reality, this is yet another thinly-disguised attempt to move the goalposts. More savvy antivaccinationists know that the kind of testing they demand is unethical, prohibitively expensive, and impractical, but demanding it allows them to claim (falsely) that there is no science supporting the safety of the current vaccine schedule and provide a complaint that sounds as though it has merit to those without a background in medicine and clinical trials. Moreover, contrary to the claims that the current vaccine schedule “overloads the immune system,” there are actually fewer antigens now in more vaccines, thanks to better vaccine design. Like the “Green Our Vaccines” slogan, the “Too many, too soon” slogan is also nothing more than a fairly clever strategy of preemptively moving the goalposts. Conveniently, the GOV folks never quite tell us which vaccines should be delayed and why or what the tradeoff would be in terms of exposing children to vaccine-preventable disease for a longer period of time before they are vaccinated. That’s not the point. Casting doubt on the safety and efficacy of vaccines is. I’m still undecided whether this is the worst analogy ever or the best, albeit unintentionally. On the one hand, consider this: A fire engine is going to save people’s lives and put out fires; if it hits someone on the way to its destination it would by definition be hitting someone who was not its intended target. For that analogy to hold with vaccines, the shots would somehow have to be killing or injuring kids who never got them. They’re not. They’re not even, as far as science can tell, causing autism. So Carrey’s analogy is quite specious. On the other hand, the analogy is unintentionally spot on. After all, if we “slow down” fire engines, as he suggests, it would take them longer to get to fires. Some people who might have been saved if the fire engine arrived faster would then be likely to die because the firefighters and rescue teams arrive too late. If we slowed down the vaccination schedule, as Carrey suggests, that would leave more children vulnerable to vaccine-preventable diseases for a longer period of time, meaning that more children would certainly become ill and more might well die. Yes, the Jen and Jim show are delivering exactly what you think: It’s the infamous “science was wrong before” gambit, beloved of cranks of all stripes, be they quacks or cranks. Naturally, the implication of the “science has been wrong before” gambit is that Jenny and Jim’s “science” is correct and the present scientific consensus is radically wrong. In other words, it’s also an implied Galileo gambit. Although Jenny’s makes a good point about the now discredited “refrigerator mother” hypothesis regarding the cause of autism and I can’t blame mothers for being royally ticked off at being blamed for their children’s autism in that way in the past, McCarthy is so incredibly, extravagantly, outrageously wrong in comparing the prior lack of concern about cigarette smoking to the science showing no correlation between vaccines and autism. Indeed, it’s impossible not to point out that the same epidemiological science that demonstrated a bulletproof link between smoking and lung cancer and that smoking was associated with a number of other diseases is the very same sort of epidemiological science that has, despite trying in multiple large studies, failed to find a link between vaccines and autism. Of course big pharma is suppressing the evidence. At least that’s what Jim Carrey and Jenny McCarthy (not to mention Robert F. Kennedy, Jr., who also spoke at the rally) believe. Whatever sins of big pharma and the government, it strains credulity to the breaking point every bit as much as 9/11 Truthers do when they claim that the government was involved in the 9/11 attacks to postulate such a huge conspiracy to cover up evidence that vaccines cause autism. For one thing, the government and big pharma are just not that competent at keeping explosive secrets secret for very long. I believe in vaccines, but I don’t believe they are 100% safe. Until they prove it to me, my child is having no more. Do you drive your kids around in a car? How can you do that? It’s by no means “100% safe”! Do you know how many children die or suffer permanent brain injury in car crashes every year? Thousands! By your standards, then, shouldn’t you should be demanding “100%” safety from your auto before driving your children anywhere in it? Do you let your children swim? How can you be so irresponsible? 5,000 children a year are hospitalized for drowning or near-drowning. 20% die, and 15% suffer permanent neurological injury. (It’s true.) Do you have a child who plays baseball or softball? Don’t you know that 4-5 children a year in the U.S. die of injuries suffered playing baseball or softball. But deaths are only the worst injuries. Among children ages 5-14, well over 100,000 children are taken to the emergency room for injuries suffered playing baseball each and every year. These include sprains, contusions, fractures, dental injuries, head injuries and concussions, and internal injuries. In fact, although its overall rate of injury is fairly low, baseball has the highest child fatality rate of any sport. I really hope your children don’t like sports, especially baseball. Clearly you, by your demand for 100% safety must not allow them to participate in any of these activities, nor must you allow them to cross the street or go to school. All these activities are far more dangerous than any vaccine. Indeed, one can’t help but note that if you applied the same standard to daily activities as you do to vaccines, your children would have to live in a hermetically sealed bubble, never venturing out. Oh, wait. That wouldn’t be “100% safe” either. Life isn’t “100% safe.” Nothing is. The “100% safety” gambit is a variant of what is known as the “perfect solution” or “Nirvana” fallacy. It is an excuse for not doing something to fix or prevent a problem based on the assertion that the solution isn’t perfect. By any measure, vaccines are incredibly safe interventions, with a very low risk of complications. The risk, however, is not and never will be zero. Nothing is absolutely, positively 100% safe, including vaccines. However, they are certainly far safer than allowing children to be vulnerable to the diseases they prevent. 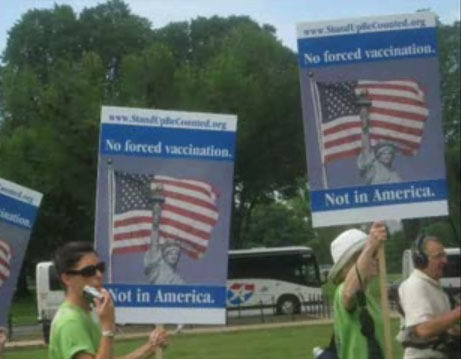 No one–and I mean no one–is arguing against safer vaccines. That’s a straw man argument that the the “Green Our Vaccine” movement finds useful as a rebuttal when the scientific vacuousness of its position is pointed out. In fact, a lot of money and effort are put into trying to make our vaccines as safe as possible, and that’s a good thing. Nor do I (or anyone else I’m aware of) argue that the parents in the rally don’t care about their children or aren’t trying to do what they believe to be best for them. What I do argue, as does Steve Novella, is that for all their good intentions these activists are, alas, spectacularly mistaken about the science that they believe to support their beliefs. 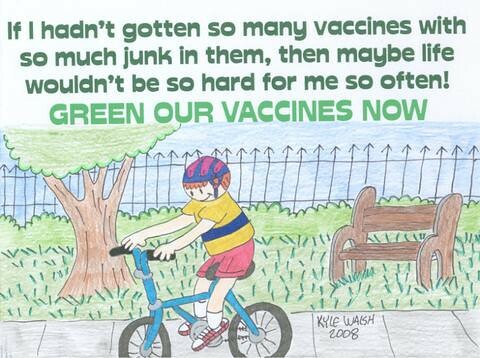 Indeed, the entire “Green Our Vaccines” is based on a toxic mix of bad science, emotion, and misinformation about “toxins” that ignores chemistry, pharmacology, and even common sense, all tied together with the fallacy of the perfect solution. That’s no basis for public policy, and the “Green Our Vaccines” movement has the potential to do real harm to public health. But maybe I’m mistaken. If that’s the case, then I ask anyone supporting the “Green Our Vaccine” movement who may read this to answer a few simple questions: How safe is safe enough for vaccines? Please be specific and remember that 100% safety is a completely unrealistic and unobtainable goal for any human activity, including vaccination. Show me why, in the case of vaccines, my view that it’s nothing more than a transparent excuse for not vaccinating, no matter what is wrong. With that in mind, what, specifically, would it take for you to agree to vaccinate your child? Remember also that vague platitudes about removing “ALL the toxins” from vaccines don’t count, because such a standard is impossible to achieve and therefore meaningless in terms of medicine and public policy. There will always be trace amounts of scary-sounding chemicals in vaccines, just as there are in every food that we eat and virtually every product to which we expose ourselves. There will always be proteins from viruses and bacteria, because it’s those proteins that contain the antigens that provoke the preemptive immune response that vaccines are designed to produce. The question to you is: Which specific toxins need to be removed and why? Please go back and read this before answering, though, because answers based on a misunderstanding of chemistry, pharmacology, and toxicology or on misinformation about what’s in vaccines don’t help clarify what “greening our vaccines” means, either. If you’re truly going to “green our vaccines,” you need to explain exactly what that means in scientific terms; otherwise it’s an impossible task. Scientists are funny that way. They need specifics. 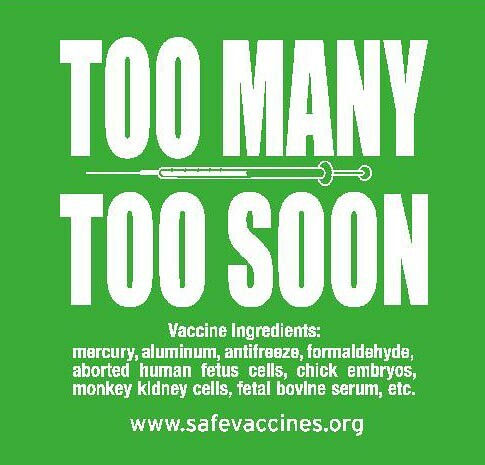 We all want our vaccines to be as safe as humanly possible, but no matter what we do they will never, ever be absolutely, 100% safe. That’s an impossible standard. The reasonable and obtainable standard to which we strive is that vaccines should be far, far safer than the diseases against which they protect us, and they already meet this standard admirably. That is not to say that there isn’t always room for improvement. There is. However, there is also a point of diminishing returns, where each incremental increase in safety comes at an increasing cost. That’s the real world, and balancing relative risks and costs of the vaccination program or any medical screening or intervention program is what must be done in the real world. The demand for “100% safety” is a utopian ideal whose real, albeit unacknowledged, purpose is an excuse for not vaccinating at all. If we are to avoid a return to the bad old days, when epidemics of vaccine-preventable diseases wreaked suffering and death upon our populace, the misinformation and exaggerated claims of “toxicity” and harm due to vaccines must be countered with science-based information of the true benefits and risks of vaccination.